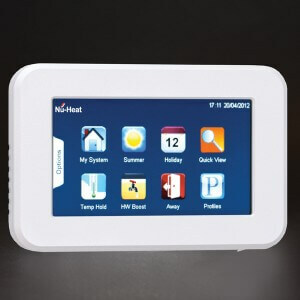 Nu-Heat has launched a new, wider range of thermostats to meet the more sophisticated needs of its energy efficient heating systems. Over recent years, the way that controls are thought about has changed immensely, with more attention being paid to the part they play in a heating system. This can be attributed to an increased awareness of the benefits of not using more energy than is actually necessary, thus improving the carbon footprint of a home. Controls are especially important with underfloor heating or renewable heating systems and Nu-Heat felt that there was a need for a range that met the twin needs of flexibility and integration. The new range was implemented after discussions within installers at a series of seminars. These installers commented that they would like to see simple wall-mounted dial versions and Smart App options. They also agreed that the best thermostat available has always been a deluxe low voltage type. Nu-Heat’s new offer includes options to fulfil these expectations. Floor stats, room stats and bathroom stats now have a uniform look, giving a clean, consistent appearance to the control element of the heating system. Each thermostat has a setback facility, helping a heating system to achieve greater levels of efficiency and giving greater flexibility of control. Dial thermostats (DS): mains voltage, digital stat with setback facility, supplied with a four-channel timeclock. Pushbutton mains (PbS): Programmable thermostat, mains voltage, with a backlit screen. Pushbutton wireless (PbR): As PbS but wireless. Pushbutton Low Voltage (PbL): Programmable thermostat, low voltage, networkable. Backlit screen. Requires CAT5 screened cable. Touchscreen Low Voltage (TsL): As PbL but with touchscreen rather than push button. Nu-Heat’s thermostat range is available as part of their complete design and supply package for UFH whether as part of a renewable heating system, or more traditional boiler system.